Standard tripod thread sizes and camera thread sizes… these are standard throughout the world. On the left 3/8 inch 16 UNC thread on a Manfrotto camera mount. 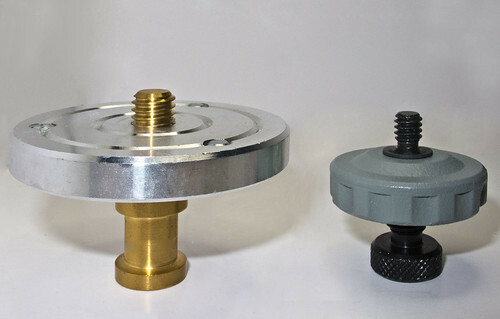 On the right a 1/4 inch 20 UNC thread for a removable tripod top. The 1/4 – 20 UNC thread (right) is the standard on most consumer cameras. These are set out under the ‘Unified Thread Standard’ (UTS). It’s published by the American National Standards Institute (ANSI). The camera thread is a UNC specification for a ‘coarse’ thread. The Standard ISO 1222:2010 Photography – Tripod connections allows for the same fit in metric size. By 16 threads per inch UNC thread. Quality manufacturers are aware of this compatibility of threads. For example, buying a tripod head and tripod from the same manufacturer usually means compatible thread and mounting standards. Beware of the equipment range trap. Some “pro-range” equipment may have a photography thread size that differs from the standard “consumer range” photography thread size. That difference is despite being made by the same manufacturer. If you are picking and choosing equipment from different equipment ranges or from different manufactures, check photography thread size compatibility first. If you do buy differing photography thread sizes on equipment there is probably a converter available. However, it is better to have a direct fit than fiddle around with converters on your expensive equipment. Most cameras, tripods and other photo-equipment have mounting screws or threaded holes. If these do not match you have a problem. Actually, matching a tripod and camera thread is easy. These threads are standard sizes. A variety of adapters are widely available and cheap. Click the link below to see a some adapters. Some tripod manufacturers fit the larger sized 3/8in – 16 UNC to their tripods. When buying a tripod make sure you buy it with one of the standard fitting threads given in the table above. Alternatively, make sure you are able to use a converter if needed. Very old tripods may not have used the same photography thread sizes I gave above. In most cases a digital camera will mount on a legacy tripod. Just check it with a fitting test. But do not force the thread if it is tight. For modern tripods the threads size for the tripod head and the camera fitting is the modern standard. Tripod Heads fit onto the same standard photography thread sizes used on the tripod. So buying a tripod head from a modern photography manufacturer ensures a proper fit to a standard tripod screw (one of the two sizes given above). But, make sure you buy the compatible thread size. Obviously, if the tripod mount has the large size thread (3/8 inch), a tripod head with a small sized hole (1/4 inch) will not mount in a stable way on it as you will have to use an inverting converter. A wider range of fittings are found on light stands and light fittings, flash units and special mountings. They tend to meet the same standards of thread sizes on modern equipment. That allows the easy inter-change of photographic kit. Again, modern manufacturers are aware of the standards. So buying lighting equipment from reputable suppliers and manufacturers will usually ensure compatible thread sizes as I give them above. I bought a light stand that looked like a good deal from a Hong Kong supplier. It did not have a compatible screw on the top for anything except the supplied fitting. This meant that the stand is of very limited use and will not fit with any of my other stands or lighting equipment. The moral is, beware of “knock-offs” and cheap imitations. Stick with reputable manufacturers. That message is true of most photography equipment. This entry was posted in Background Info., DIY Projects, Equipment, Insights, Tips Tutorials & Techniques and tagged Buying equipment, Camera, DIY, equipment, Photography thread size, Tripod. Bookmark the permalink.